Naturist Times, Issue #0039 -- Bits and Pieces! Naturist Times brings you news of updates to our website and other naturist 'bits and pieces'. If you like this newsletter, please do a friend and us a big favour by sending it on. Not Booked Yet? Three More Ideas For You! One of the wonderful things about writing our website is that we are always hearing of new resorts and accommodation. Since our last newsletter in May we have heard of three more great opportunities for your Summer holidays. Fantastic news! Ecotara Retreat on Gran Canaria is opening its doors to naturists for the first time this summer. This is just so exciting because Ecotara's philosophy of life is ideally suited to naturism! They have created a wonderfully sustainable and peaceful setting, perfect for resting, restoration and well-being. 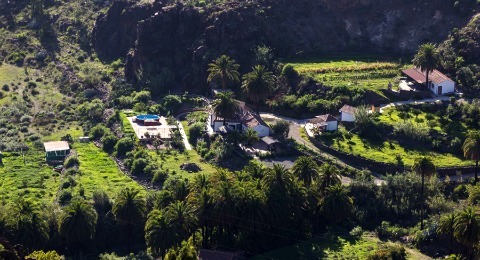 The retreat is located in a stunning location in the southern part of the island of Gran Canaria. It is situated in a 25,000 m2 of land with fruit trees, a vegetable garden, swimming pool, jacuzzi and lots of spaces for deep relaxation and reconnection with nature. Ecotara will be open exclusively for naturists every day from 26th of June until the 1st of October when you can stay there on a self-catering basis, try their organic vegetables and join free yoga classes whenever they are available. They are also offering a naturist Healthy Living retreat week from the 12th to the 18th of August, and a naturist Family retreat week from the 21st to the 27th of August. Visit the Ecotara page for more details! Sitting high on a hillside, Finca Xanadu is surrounded by almond and olive groves, and pines stretching up into a natural park in this beautiful part of inland Spain. The main attraction at Finca Xanadu has to be the incredible infinity pool. 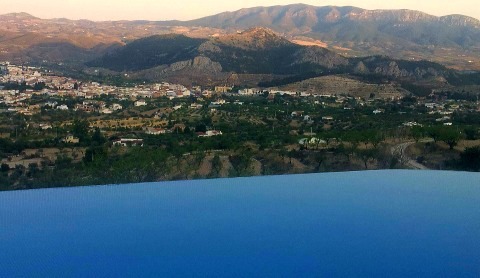 The pool has a long, curved infinity edge which overlooks the almond and olive groves, and the town below and with spectacular views stretching to the hills and fields beyond. At night it’s even better when its lights show off just how stunning the setting is. The pool is overlooked by all four of the beautiful bedrooms at Xanadu. Accommodation at Finca Xanadu is on an all-inclusive basis, and by that they mean for you to never be hungry or thirsty. Should you wish to book the whole property there is accommodation for up to twelve people. Ideal for a group of friends or a naturist club. Click here for more information on Finca Xanadu! Costa Natura 176 is a 30 m2 apartment with a 16 m2 terrace, and suitable for two people. The apartment has been completely renovated to an exceptionally high Scandinavian designer standard. It is equipped with full air conditioning. Costa Natura 176 is situated to the south and east, providing sun on the terrace from early morning until mid-afternoon. The location is absolutely superb in the first line and directly onto the lawn, beyond which the beach awaits. As it is located far away from the road, traffic noise is no issue; you will only hear the sound of the waves. Privacy is secured by a low hedge. 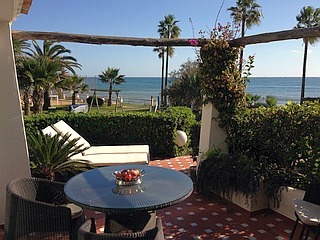 The sweeping sea views from the terrace are breathtaking and inspiring. The patio furniture and sunbeds are of very high quality. Find out more about Apartment 176 at Costa Natura. If you should contact any of the many wonderful naturist accommodations that appear on our site we would really appreciate it if you mentioned our names. Many thanks! We love hearing from you and thank you very much to all our fellow naturists who contact us. We will always try to reply to you. If you see a man with this tattoo on his hip, come and say hi! Have a fantastic summer and please keep in touch and let us know what you are doing!